If you plan to migrate from one server to another and take only the theme settings, or you just want to copy them to another install, you can use the theme integrated Import / Export system. 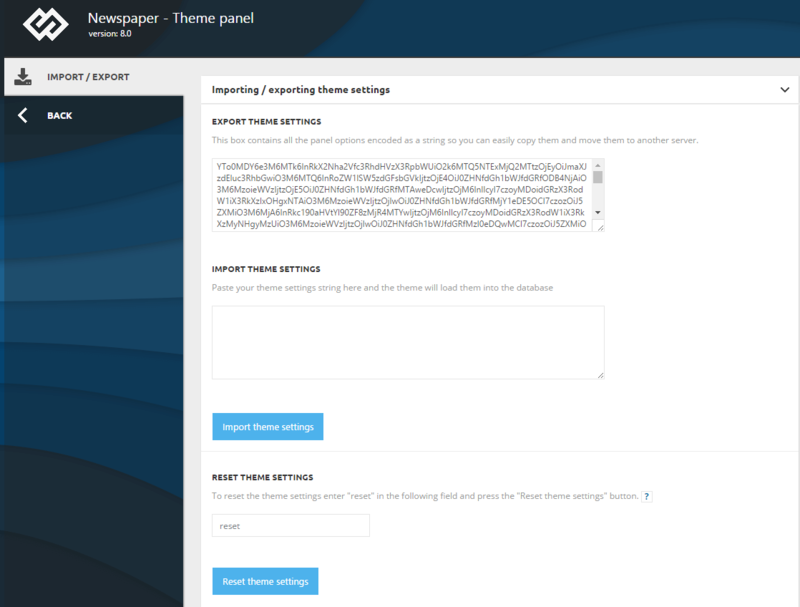 The settings are located in Newspaper > Theme Panel > Import / Export. The theme settings are all the settings made inside the Theme Panel area, they don’t include any content or settings made on pages or posts. To export the settings you just have to select the encoded string by clicking inside the Export Theme Settings box and then pressing CTRL+A. Next use CTRL+C to copy it and then you can paste it directly into another install or save the code inside a simple text file. If you plan to save it inside a text file make sure you use a code editor like Notepad++, a word editor like Microsoft Word may add text formatting and this will alter the code, for import you have to keep the code in its original form. The import is simple, just paste the encoded settings encoded string into the Import Theme Settings box and press the Import Theme Settings button. If a demo is installed it’s content will also be removed. The theme will return to the default, as it was on its first install. Note that the length of this process may vary (10 – 40 seconds), please wait until the reset confirmation message appears. Note – This operation is not reversible. To reset the theme settings you have to enter “reset” inside a dedicated field and press the Reset Theme Settings button.